The combustion chamber is designed meticulously by giving proper grate area and dimensions to give high combustion efficiency even on LCV fuels. The system is designed to use fuel of user's choice. 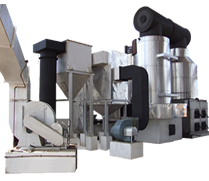 The system guarantees rated output on low calorific value fuels like lignite, agricultural wastes like husk, bagasse, wood wastes, wood chips, saw dust, coal, groundnut shell etc. The vertical four pass thermic fluid heater is suited for various industries across India and abroad in this rapidly changing and undependable energy situations. Alfa Entech's generous design of vertical heaters coupled with integral furnace gives you an assurance of the rated output on any solid fuels like Coal, Wood, Lignite, Husk, Bagasse, Pet Coke, Saw dust etc without compromising on performance. Alfa Entech can deliver sustainable solution to meet your process requirement and thus improve process consistency and reduce downtime leading to further increase in profitability. Fluidized Bed Combustion Technology is best suited for some of the fuels like low grade coal, paddy husk, agro waste, etc. with high ash content. Efficient Combustion of low grade fuels. The Four Pass thermic Fluid Heat Exchanger System comprises of two heat exchangers. The coil of radiant heat exchanger is in conical shape and is fabricated out of high heat resistant ERW boiler tube. It is mounted on suitable designed furnace. It is fabricated out of heavy duty material and provided with necessary fuel feeding arrangement. Furnace is constructed with high quality fire bricks and insulation bricks. The bricks wall is designed in such a way that it ensures minimum heat loss. Convection zone heat exchanger is designed on coil to coil principle comprising 2 coils fabricated out of high heat resistant ERW boiler tubes. Outer shell of the heat exchanger is covered with high grade insulating materials. Both radiant and convective heat exchangers are connected by a specially designed refractory duct which allows flue gas to pass from radiant to convective exchanger.